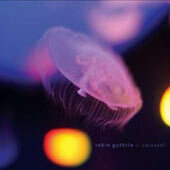 2009 is a very productive year for Robin Guthrie. This is the third Guthrie release that EvilSponge has covered their year, and i feel that i should warn readers that there is yet another one to come! If you are burned out on our wall-to-wall Robin Guthrie coverage, perhaps you should leave this review now. YouTube has a variety of diversions for the non-Guthrie fan to enjoy. Carousel is Guthrie's first full-length solo album since the dissolution of Violet Indiana, his second band. Now, he has also released three album-length collaborations and two movie soundtracks, many of which have been reviewed here. (See what i mean about wall-to-wall coverage. It's true, i am a fanboy…) All of this means that there is a lot of Robin Guthrie music out there. And Carousel is, i hate to say it, more of the same. That is to say, Carousel finds Mr. Guthrie doing what he does best: making instrumental tunes mostly out of heavily effected guitar, and straddling the line between pop music and ambient music. There are no vocals or vocal samples here, and this is not an electronic style album in the least. It is pop music that is often slow and delicate. If you enjoy this type of thing, then i think you will have to agree that Guthrie does it best. If you are bored by this type of music, then you will not find anything to change your mind here. For those of you who do like this style, there is much to enjoy. Guthrie turns in another fine performance. Carousel finds him in a reflective mood. These songs tend to be among the lighter end of his spectrum, more ambient than pop. Not to say that there are not great active tunes here. In fact, Sparkle reminds me a lot of what Guthrie was doing on Milk and Kisses, the final Cocteau Twins record. The drumming, that insistent tight snare beat, and guitar layering (one strummed, one echoing, and one picking out a faint melody) all remind me of that record. However, i don't want readers to think that Carousel is just Guthrie rehashing past glories. On the contrary, i have only mentioned two of the ten songs on the record so far. The other eight are more within the vein of his solo and soundtrack work. These are ambient pieces, and i think that Guthrie gives us some of his best ambient work here. Search Among the Flowers pairs a wandering, whooshing synth tone to two layers of guitar, one a steady arpeggio, and the other a slow picked melody that swells with tremolo as the song grows. Very lovely. Mission Dolores finds Guthrie playing an organy keyboard here, much like he did on the recent Angel Falls EP. I guess that he has collaborated with so many keyboardists (well, just Harold Budd and John Foxx) that he decided to add such a sound to his own work. Here he adds an organ drone to a ponderous bass riff and echoed guitar. This is lovely song that marries the Violet Indiana sound to his more ambient work. The album's title track, Waiting by the Carousel instead reminds me of the Budd and Cocteau Twins collaboration record, The Moon and the Melodies. Guthrie uses heavy echo here, like he did on that record. However this song explodes after a few minutes, with an upsurge of drumming and many layers of soaring guitar. Fine work, all of it. I really can't complain, and i find that rather enjoy this album. Is it the best of his solo work? Probably not, but it shows the same craft and care that Guthrie puts into all of his work, displaying the same quality. So if you like this type of thing, then you should definitely check out this record. If instrumental ambience is not for you, then i would suggest you stay away.